Here is a hospital story with a difference, for it is set on a Burmese island where one white doctor and two nurses, with a native staff, waged a ceaseless war against tropical diseases, parasites and an utterly exhausting climate. Pat found it hard going in any case…but much more so when she fell in love with the doctor whose only feeling for her seemed to be intense irritation. 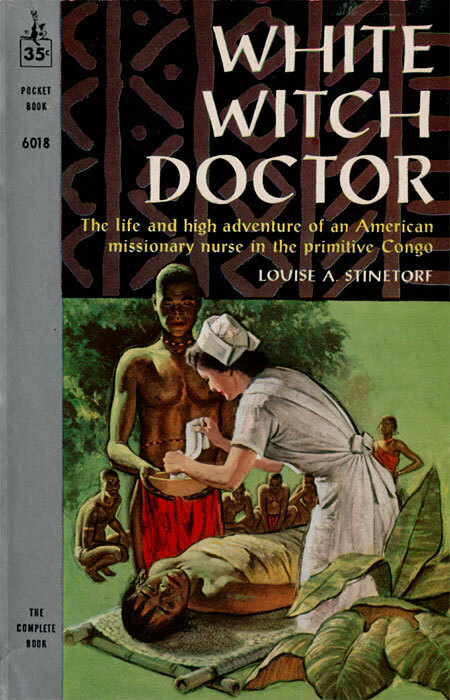 The life and high adventure of an American missionary nurse in the primitive Congo. 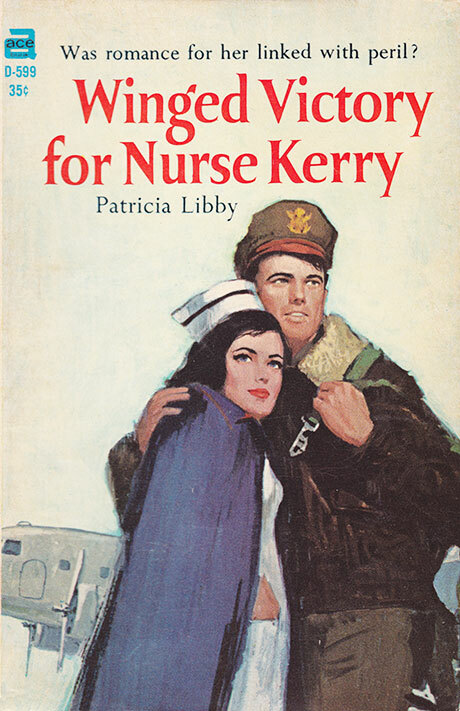 Nurse Ellen Burton could smell fresh blood. The she saw the chilling scene. A goat had been pegged to the ground. Aganza was groveling on all fours in front of it. N’Devli, the witch doctor, jumped up and down screeching wildly. Each time he hit the ground, he pricked Aganza with his spear. “Stop it! Stop it!” Ellen shrieked. Without thinking of her own safety, she leaped forward and wrenched the spear from the witch doctor’s hands. White Witch Doctor is high adventure at its thrilling best. 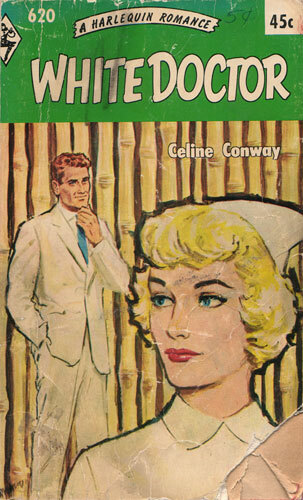 An amazing story of a missionary nurse’s life in the Belgian Congo, it is filled with relentless excitement, warm humor and great love. But why settle for a pastiche of crude cultural and racial stereotypes when you can have a pastiche of crude cultural, racial, and religious stereotypes? 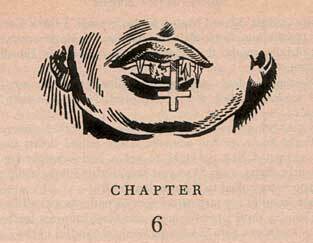 The story began with a description of the filing of front teeth, once a mark of cannibalism. The teeth were not literally filed. The witch doctor sat on a boy’s chest and, with a stone chisel and wooden mallet, chipped bits of the teeth away–much as the Indians used to make arrowheads. The operation, unbearably cruel, was a test of a boy’s manhood, of his general fitness to become a hardy, responsible member of the tribe. Some of the teeth were hopelessly ruined, and when the boy reached the foppish age of young manhood, he carved others to take their place. They were sometimes amazing creations. Carved of wood or ivory, according to the wealth of the young man, they represented his accomplishments–a lion killed, or an elephant, or a leopard, or, if he had somehow acquired much wealth and therefore many wives, a phallic symbol. Some were exquisitely carved. But, beautiful or crude, these teeth were set on pins and inserted into the decayed roots in the young warrior’s head. Onege had many such teeth…and he acknowledged his debt to the missionaries in his own fashion. He carved himself one more tooth, which he always wore in the presence of a white man. It protruded from his upper gum and extended over his lower lip clear to the tip of his chin. It was a beautifully proportioned, exquisitely carved ivory cross. When Dr. Charles came, I laughed at his mountainous luggage, forgetting that I had been guilty of exactly the same thing. Among other odds and ends, he brought a galvanized iron bath tub, which we all looked at with wondering eyes, hoping desperately that sometime, somehow, we should be invited to bathe in it. Just to sit down in that tub and feel soft, warm, perhaps even perfumed, water lapping about our tummies suddenly seemed the most enticing experience imaginable. We never knew that luxury, however. 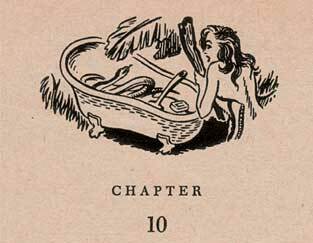 Only a few days after Dr. Charles set up the tub in his bathing dukas–with a most ingenious arrangement of plumbing contrived from joints of bamboo–his wife found a snake coiled up in the bottom of it one morning, and in her efforts to kill it with a club, she knocked apart every seam in the tub. 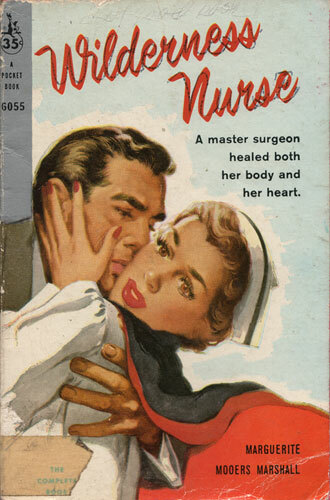 A master surgeon healed both her body and her heart. KEEP FIGHTING. BE SEEING YOU. Denise slept at last, the telegram under her pillow.